No 2 in the UK best seller charts! Joss, aged 13, was angry and out of control when she came to live with me. Two previous foster carers and an aunt had tried but failed to help her. I had doubts I would do any better and I knew I was her last chance. Her next move would be to a secure unit for her own protection. In prison at the age of thirteen! Joss smoked cannabis, drank alcohol, went missing overnight and was in trouble with the police and at school. I worried about the effect her behaviour was having on my teenage children, especially when I wasn’t able to make a difference and her behaviour continued to deteriorate. Yet I could understand why Joss was so angry, confused and upset. Four years previously, aged only 9, Joss had arrived home from school to find her father’s lifeless body hanging in the garage. He had committed suicide. Another amazing read by Cathy Glass. Once I pick up her books I can never put them down until that last page has been read. I am never disappointed. Another brilliant book by this author, I have enjoyed every single one of her books…told with great sensitivity. I loved this book. I have every book that Cathy Glass has written. I would highly recommend. Another amazing book couldn’t put it down l.
Heat magazine. No 4 in their top ten books. …deceptively easy style which builds the suspense expertly and teases out the various events in a totally gripping manner. 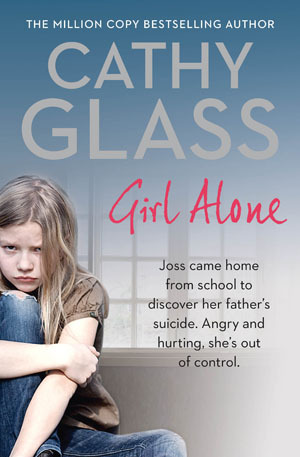 As always with Cathy’s books the story is very touching but also has details of abuse. I’d advise keeping tissues nearby. The language is very emotive too. The detail involved is spot on.